Delving into the ancient Tomb of Horrors, slipping through the back alleys of Waterdeep, hacking a fresh trail through the thick jungles on the Isle of Dread—these are the things that Dungeons & Dragons adventures are made of. Your character in the game might explore forgotten ruins and uncharted lands, uncover dark secrets and sinister plots, and slay foul monsters. And if all goes well, your character will survive to claim rich rewards before embarking on a new adventure. This section covers the basics of the adventuring life, from the mechanics of movement to the complexities of social interaction. The rules for resting are also in this section, along with a discussion of the activities your character might pursue between adventures. The DM narrates the results of their actions. Typically, the DM uses a map as an outline of the adventure, tracking the characters’ progress as they explore dungeon corridors or wilderness regions. The DM’s notes, including a key to the map, describe what the adventurers find as they enter each new area. Sometimes, the passage of time and the adventurers’ actions determine what happens, so the DM might use a timeline or a flowchart to track their progress instead of a map. In situations where keeping track of the passage of time is important, the DM determines the time a task requires. The DM might use a different time scale depending on the context of the situation at hand. In a dungeon environment, the adventurers' movement happens on a scale of minutes. It takes them about a minute to creep down a long hallway, another minute to check for traps on the door at the end of the hall, and a good ten minutes to search the chamber beyond for anything interesting or valuable. In a city or wilderness, a scale of hours is often more appropriate. Adventurers eager to reach the lonely tower at the heart of the forest hurry across those fifteen miles in just under four hours' time. For long journeys, a scale of days works best. Following the road from Baldur's Gate to Waterdeep, the adventurers spend four uneventful days before a goblin ambush interrupts their journey. In combat and other fast-paced situations, the game relies on rounds, a 6-second span of time. Swimming across a rushing river, sneaking down a dungeon corridor, scaling a treacherous mountain slope--all sorts of movement play a key role in fantasy gaming adventures. The DM can summarize the adventurers' movement without calculating exact distances or travel times: "You travel through the forest and find the dungeon entrance late in the evening of the third day." Even in a dungeon, particularly a large dungeon or a cave network, the DM can summarize movement between encounters: "After killing the guardian at the entrance to the ancient dwarven stronghold, you consult your map, which leads you through miles of echoing corridors to a chasm bridged by a narrow stone arch." Sometimes it's important, though, to know how long it takes to get from one spot to another, whether the answer is in days, hours, or minutes. The rules for determining travel time depend on two factors: the speed and travel pace of the creatures moving and the terrain they're moving over. Every character and monster has a speed, which is the distance in feet that the character or monster can walk in 1 round. This number assumes short bursts of energetic movement in the midst of a life-threatening situation. The following rules determine how far a character or monster can move in a minute, an hour, or a day. While traveling, a group of adventurers can move at a normal, fast, or slow pace, as shown on the Travel Pace table. The table states how far the party can move in a period of time and whether the pace has any effect. A fast pace makes characters less perceptive, while a slow pace makes it possible to sneak around and to search an area more carefully. Forced March. The Travel Pace table assumes that characters travel for 8 hours in day. They can push on beyond that limit, at the risk of exhaustion. For each additional hour of travel beyond 8 hours, the characters cover the distance shown in the Hour column for their pace, and each character must make a Constitution saving throw at the end of the hour. The DC is 10 + 1 for each hour past 8 hours. On a failed saving throw, a character suffers one level of exhaustion. Mounts and Vehicles. For short spans of time (up to an hour), many animals move much faster than humanoids. A mounted character can ride at a gallop for about an hour, covering twice the usual distance for a fast pace. If fresh mounts are available every 8 to 10 miles, characters can cover larger distances at this pace, but this is very rare except in densely populated areas. Characters in wagons, carriages, or other land vehicles choose a pace as normal. Characters in a waterborne vessel are limited to the speed of the vessel, and they don't suffer penalties for a fast pace or gain benefits from a slow pace. Depending on the vessel and the size of the crew, ships might be able to travel for up to 24 hours per day. Certain special mounts, such as a pegasus or griffon, or special vehicles, such as a broom of flying, allow you to travel more swiftly. The travel speeds given in the Travel Pace table assume relatively simple terrain: roads, open plains, or clear dungeon corridors. But adventurers often face dense forests, deep swamps, rubble-filled ruins, steep mountains, and ice-covered ground--all considered difficult terrain. You move at half speed in difficult terrain--moving 1 foot in difficult terrain costs 2 feet of speed--so you can cover only half the normal distance in a minute, an hour, or a day. Movement through dangerous dungeons or wilderness areas often involves more than simply walking. Adventurers might have to climb, crawl, swim, or jump to get where they need to go. While climbing or swimming, each foot of movement costs 1 extra foot (2 extra feet in difficult terrain), unless a creature has a climbing or swimming speed. At the DM’s option, climbing a slippery vertical surface or one with few handholds requires a successful Strength (Athletics) check. Similarly, gaining any distance in rough water might require a successful Strength (Athletics) check. Your Strength determines how far you can jump. You can extend your arms half your height above yourself during the jump. Thus, you can reach above you a distance equal to the height of the jump plus 1 1/2 times your height. As adventurers travel through a dungeon or the wilderness, they need to remain alert for danger, and some characters might perform other tasks to help the group’s journey. The adventurers should establish a marching order. A marching order makes it easier to determine which characters are affected by traps, which ones can spot hidden enemies, and which ones are the closest to those enemies when a fight breaks out. A character might occupy the front rank, one or more middle ranks, or the back rank. Characters in the front and back ranks need enough room to travel side by side with others in their rank. When space is too tight, the marching order must change, usually by moving characters to a middle rank. Fewer Than Three Ranks. If an adventuring party arranges its marching order with only two ranks, they are a front rank and a back rank. If there’s only one rank, it’s considered a front rank. While traveling at a slow pace, the characters can move stealthily. As long as they’re not in the open, they can try to surprise or sneak by other creatures they encounter. See the rules for hiding in the Using Ability Scores section. Sometimes, it makes sense to split an adventuring party, especially if you want one or more characters to scout ahead. You can form multiple parties, each moving at a different speed. Each group has its own front, middle, and back ranks. The drawback to this approach is that the party will be split into several smaller groups in the event of an attack. The advantage is that a small group of stealthy characters moving slowly might be able to sneak past enemies that clumsier characters would alert. A pair of rogues moving at a slow pace are much harder to detect when they leave their dwarf fighter friend behind. Use the passive Wisdom (Perception) scores of the characters to determine whether anyone in the group notices a hidden threat. The DM might decide that a threat can be noticed only by characters in a particular rank. 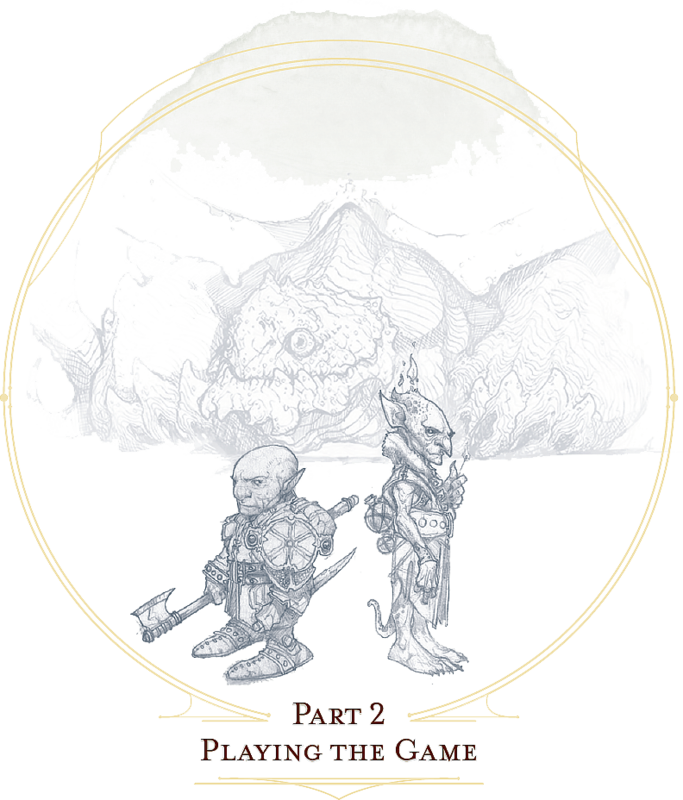 For example, as the characters are exploring a maze of tunnels, the DM might decide that only those characters in the back rank have a chance to hear or spot a stealthy creature following the group, while characters in the front and middle ranks cannot. While traveling at a fast pace, characters take a –5 penalty to their passive Wisdom (Perception) scores to notice hidden threats. Encountering Creatures. If the DM determines that the adventurers encounter other creatures while they’re traveling, it’s up to both groups to decide what happens next. Either group might decide to attack, initiate a conversation, run away, or wait to see what the other group does. Surprising Foes. If the adventurers encounter a hostile creature or group, the DM determines whether the adventurers or their foes might be surprised when combat erupts. See the Combat section for more about surprise. Characters who turn their attention to other tasks as the group travels are not focused on watching for danger. These characters don’t contribute their passive Wisdom (Perception) scores to the group’s chance of noticing hidden threats. However, a character not watching for danger can do one of the following activities instead, or some other activity with the DM’s permission. Draw a Map. The character can draw a map that records the group’s progress and helps the characters get back on course if they get lost. No ability check is required. When a creature runs out of breath or is choking, it can survive for a number of rounds equal to its Constitution modifier (minimum of 1 round). At the start of its next turn, it drops to 0 hit points and is dying, and it can't regain hit points or be stabilized until it can breathe again. The most fundamental tasks of adventuring--noticing danger, finding hidden objects, hitting an enemy in combat, and targeting a spell, to name just a few--rely heavily on a character's ability to see. Darkness and other effects that obscure vision can prove a significant hindrance. A heavily obscured area--such as darkness, opaque fog, or dense foliage--blocks vision entirely. A creature effectively suffers from the blinded condition when trying to see something in that area. Many creatures in fantasy gaming worlds, especially those that dwell underground, have darkvision. Within a specified range, a creature with darkvision can see in darkness as if the darkness were dim light, so areas of darkness are only lightly obscured as far as that creature is concerned. However, the creature can't discern color in darkness, only shades of gray. A creature with truesight can, out to a specific range, see in normal and magical darkness, see invisible creatures and objects, automatically detect visual illusions and succeed on saving throws against them, and perceives the original form of a shapechanger or a creature that is transformed by magic. Furthermore, the creature can see into the Ethereal Plane. Characters who don't eat or drink suffer the effects of exhaustion. Exhaustion caused by lack of food or water can't be removed until the character eats and drinks the full required amount. A character can go without food for a number of days equal to 3 + his or her Constitution modifier (minimum 1). At the end of each day beyond that limit, a character automatically suffers one level of exhaustion. A normal day of eating resets the count of days without food to zero. A character's interaction with objects in an environment is often simple to resolve in the game. The player tells the DM that his or her character is doing something, such as moving a lever, and the DM describes what, if anything, happens. For example, a character might decide to pull a lever, which might, in turn, raise a portcullis, cause a room to flood with water, or open a secret door in a nearby wall. If the lever is rusted in position, though, a character might need to force it. In such a situation, the DM might call for a Strength check to see whether the character can wrench the lever into place. The DM sets the DC for any such check based on the difficulty of the task. Characters can also damage objects with their weapons and spells. Objects are immune to poison and psychic damage, but otherwise they can be affected by physical and magical attacks much like creatures can. The DM determines an object's Armor Class and hit points, and might decide that certain objects have resistance or immunity to certain kinds of attacks. (It's hard to cut a rope with a club, for example.) Objects always fail Strength and Dexterity saving throws, and they are immune to effects that require other saves. When an object drops to 0 hit points, it breaks. A character can also attempt a Strength check to break an object. The DM sets the DC for any such check. Exploring dungeons, overcoming obstacles, and slaying monsters are key parts of D&D adventures. No less important, though, are the social interactions that adventurers have with other inhabitants of the world. Interaction takes on many forms. You might need to convince an unscrupulous thief to confess to some malfeasance, or you might try to flatter a dragon so that it will spare your life. The DM assumes the roles of any characters who are participating in the interaction that don’t belong to another player at the table. Any such character is called a nonplayer character (NPC). In general terms, an NPC’s attitude toward you is described as friendly, indifferent, or hostile. Friendly NPCs are predisposed to help you, and hostile ones are inclined to get in your way. It’s easier to get what you want from a friendly NPC, of course. Social interactions have two primary aspects: roleplaying and ability checks. Roleplaying is, literally, the act of playing out a role. In this case, it’s you as a player determining how your character thinks, acts, and talks. Roleplaying is a part of every aspect of the game, and it comes to the fore during social interactions. Your character’s quirks, mannerisms, and personality influence how interactions resolve. There are two styles you can use when roleplaying your character: the descriptive approach and the active approach. Most players use a combination of the two styles. Use whichever mix of the two works best for you. With this approach, you describe your character’s words and actions to the DM and the other players. Drawing on your mental image of your character, you tell everyone what your character does and how he or she does it. For instance, Chris plays Tordek the dwarf. Tordek has a quick temper and blames the elves of the Cloakwood for his family’s misfortune. At a tavern, an obnoxious elf minstrel sits at Tordek’s table and tries to strike up a conversation with the dwarf. In this example, Chris has conveyed Tordek’s mood and given the DM a clear idea of his character’s attitude and actions. Describe your character’s emotions and attitude. Focus on your character’s intent and how others might perceive it. Provide as much embellishment as you feel comfortable with. Don’t worry about getting things exactly right. Just focus on thinking about what your character would do and describing what you see in your mind. If descriptive roleplaying tells your DM and your fellow players what your character thinks and does, active roleplaying shows them. When you use active roleplaying, you speak with your character’s voice, like an actor taking on a role. You might even echo your character’s movements and body language. This approach is more immersive than descriptive roleplaying, though you still need to describe things that can’t be reasonably acted out. The DM uses your character’s actions and attitudes to determine how an NPC reacts. A cowardly NPC buckles under threats of violence. A stubborn dwarf refuses to let anyone badger her. A vain dragon laps up flattery. When interacting with an NPC, pay close attention to the DM’s portrayal of the NPC’s mood, dialogue, and personality. You might be able to determine an NPC’s personality traits, ideals, flaws, and bonds, then play on them to influence the NPC’s attitude. Interactions in D&D are much like interactions in real life. If you can offer NPCs something they want, threaten them with something they fear, or play on their sympathies and goals, you can use words to get almost anything you want. On the other hand, if you insult a proud warrior or speak ill of a noble’s allies, your efforts to convince or deceive will fall short. In addition to roleplaying, ability checks are key in determining the outcome of an interaction. Your roleplaying efforts can alter an NPC’s attitude, but there might still be an element of chance in the situation. For example, your DM can call for a Charisma check at any point during an interaction if he or she wants the dice to play a role in determining an NPC’s reactions. Other checks might be appropriate in certain situations, at your DM’s discretion. Pay attention to your skill proficiencies when thinking of how you want to interact with an NPC, and stack the deck in your favor by using an approach that relies on your best bonuses and skills. If the group needs to trick a guard into letting them into a castle, the rogue who is proficient in Deception is the best bet to lead the discussion. 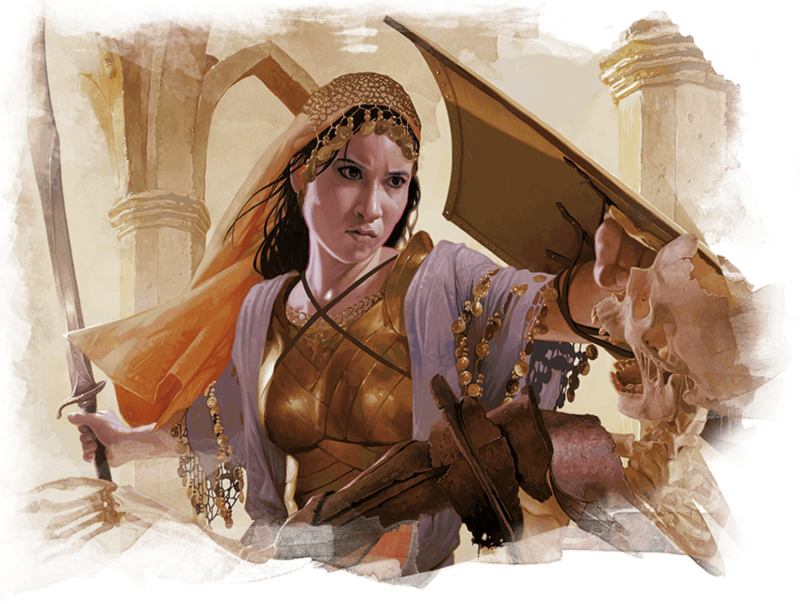 When negotiating for a hostage’s release, the cleric with Persuasion should do most of the talking. Heroic though they might be, adventurers can't spend every hour of the day in the thick of exploration, social interaction, and combat. They need rest--time to sleep and eat, tend their wounds, refresh their minds and spirits for spellcasting, and brace themselves for further adventure. Adventurers can take short rests in the midst of an adventuring day and a long rest to end the day. A character can spend one or more Hit Dice at the end of a short rest, up to the character's maximum number of Hit Dice, which is equal to the character's level. For each Hit Die spent in this way, the player rolls the die and adds the character's Constitution modifier to it. The character regains hit points equal to the total (minimum of 0). The player can decide to spend an additional Hit Die after each roll. A character regains some spent Hit Dice upon finishing a long rest, as explained below. A long rest is a period of extended downtime, at least 8 hours long, during which a character sleeps or performs light activity: reading, talking, eating, or standing watch for no more than 2 hours. If the rest is interrupted by a period of strenuous activity--at least 1 hour of walking, fighting, casting spells, or similar adventuring activity--the characters must begin the rest again to gain any benefit from it. Between trips to dungeons and battles against ancient evils, adventurers need time to rest, recuperate, and prepare for their next adventure. Many adventurers also use this time to perform other tasks, such as crafting arms and armor, performing research, or spending their hard-earned gold. In some cases, the passage of time is something that occurs with little fanfare or description. When starting a new adventure, the DM might simply declare that a certain amount of time has passed and allow you to describe in general terms what your character has been doing. At other times, the DM might want to keep track of just how much time is passing as events beyond your perception stay in motion. Between adventures, you choose a particular quality of life and pay the cost of maintaining that lifestyle. Living a particular lifestyle doesn't have a huge effect on your character, but your lifestyle can affect the way other individuals and groups react to you. For example, when you lead an aristocratic lifestyle, it might be easier for you to influence the nobles of the city than if you live in poverty. Between adventures, the DM might ask you what your character is doing during his or her downtime. Periods of downtime can vary in duration, but each downtime activity requires a certain number of days to complete before you gain any benefit, and at least 8 hours of each day must be spent on the downtime activity for the day to count. The days do not need to be consecutive. If you have more than the minimum amount of days to spend, you can keep doing the same thing for a longer period of time, or switch to a new downtime activity. Downtime activities other than the ones presented below are possible. If you want your character to spend his or her downtime performing an activity not covered here, discuss it with your DM. You can craft nonmagical objects, including adventuring equipment and works of art. You must be proficient with tools related to the object you are trying to create (typically artisan's tools). You might also need access to special materials or locations necessary to create it. For example, someone proficient with smith's tools needs a forge in order to craft a sword or suit of armor. For every day of downtime you spend crafting, you can craft one or more items with a total market value not exceeding 5 gp, and you must expend raw materials worth half the total market value. If something you want to craft has a market value greater than 5 gp, you make progress every day in 5-gp increments until you reach the market value of the item. For example, a suit of plate armor (market value 1,500 gp) takes 300 days to craft by yourself. Multiple characters can combine their efforts toward the crafting of a single item, provided that the characters all have proficiency with the requisite tools and are working together in the same place. Each character contributes 5 gp worth of effort for every day spent helping to craft the item. For example, three characters with the requisite tool proficiency and the proper facilities can craft a suit of plate armor in 100 days, at a total cost of 750 gp. While crafting, you can maintain a modest lifestyle without having to pay 1 gp per day, or a comfortable lifestyle at half the normal cost. You can work between adventures, allowing you to maintain a modest lifestyle without having to pay 1 gp per day. This benefit lasts as long you continue to practice your profession. If you are a member of an organization that can provide gainful employment, such as a temple or a thieves' guild, you earn enough to support a comfortable lifestyle instead. If you have proficiency in the Performance skill and put your performance skill to use during your downtime, you earn enough to support a wealthy lifestyle instead. You can use downtime between adventures to recover from a debilitating injury, disease, or poison. End one effect on you that prevents you from regaining hit points. For the next 24 hours, gain advantage on saving throws against one disease or poison currently affecting you. The time between adventures is a great chance to perform research, gaining insight into mysteries that have unfurled over the course of the campaign. Research can include poring over dusty tomes and crumbling scrolls in a library or buying drinks for the locals to pry rumors and gossip from their lips. When you begin your research, the DM determines whether the information is available, how many days of downtime it will take to find it, and whether there are any restrictions on your research (such as needing to seek out a specific individual, tome, or location). The DM might also require you to make one or more ability checks, such as an Intelligence (Investigation) check to find clues pointing toward the information you seek, or a Charisma (Persuasion) check to secure someone's aid. Once those conditions are met, you learn the information if it is available. For each day of research, you must spend 1 gp to cover your expenses. This cost is in addition to your normal lifestyle expenses. You can spend time between adventures learning a new language or training with a set of tools. Your DM might allow additional training options. First, you must find an instructor willing to teach you. The DM determines how long it takes, and whether one or more ability checks are required. The training lasts for 250 days and costs 1 gp per day. After you spend the requisite amount of time and money, you learn the new language or gain proficiency with the new tool.